Miter saws are a great tool when precision is wanted when making cross cuts (90 degrees) as well as miter cuts. However, shopping for a miter saw can be a bit overwhelming as there is a huge variety of saws available on the market. You’ll need to think over your needs in a saw as well as read a few miter saw reviews in order to help choose which saw will really meet your needs best. Our guide will help you make the right decision. What are a few of the best features? To whom is this best suited for? View all amazon customer’s reviews !!! To whom is this designed for? You Don’t Have to Worry Anymore! How To Choose The Best Miter Saw? For those people who don’t need a 12 inch blade for the larger cuts, you may consider checking out the DEWALT DW717. While it isn’t as fully featured as some of the other products in it’s line, it will still likely be able to handle most of the cuts that you are going to want to make. So you must be asking – what is so special about this miter saw? There are a ton of options out there, so filtering through the noise to make a good choice can be tiresome. With this one, you are going to be loving bevel cuts. With this one, you can make cuts anywhere between 0 and 48 degrees, which is plenty for the majority of projects out there. It also saves you from having to flip your cut – and instead just flip the saw. This makes things much easier to get done. If you don’t want something that needs some major adjustments when getting, you will be pleased here. Most people upon arrival are able to use the DW717 out of the box without adjustments. There are a few people who needed to make a few changes, but overall the sentiment is good in this area. It can take some time to dial it in if you want the blade a specific way – and this saves time. Truthfully, this is a great miter saw. However, we think there are better products out there. For this price, we think that looking at a few of the others in the price range or looking at some of the other options that cost a bit more is worth doing. You are likely going to be using this for a long time, so we think spending a bit more for a product which does more is the best option. This is especially true for dust collection. This is one thing that we just didn’t like here. Will you be happy with the product? Most likely. Would you be more happy with something that is better – without a doubt. The DEWALT DWS780 is one of the more high-end miter saw models provided by DEWALT. It has a price tag this large for a reason – this thing is a beast. At 15 amps and 3800 RPM, there isn’t much you won’t be able to cut. The blade, at 12 inches, is huge and is more than versatile and is easily portable despite it’s size. The big plus for the DWS780 is precision accuracy. Even if you aren’t that accurate yourself, this machine should make up for it. It contains 10 different stops that are clearly marked to make your life easier. If these weren’t easy to use though, it wouldn’t be worth mentioning. Of course, there are locking mechanisms in place to make sure you don’t make a mistake. This, along with the cross-cut alignment allows you to maneuver it like a pro. When you are using the different angle settings, there won’t be any need to worry. Of course no product is worth the money if it doesn’t last. As with most DEWALT products, this thing can taking a beating. With precision casting, durable guards, stainless steel detent plate and fences there isn’t much worry for you in this department. If you are looking for the best miter saw that requires a 12 inch blade, you can’t go wrong with this one. It is one of the more expensive models, but the overall ease of making cuts with it makes it worth the money. While the slide tends to be an issue for some people, we think it is something that can be overlooked with the rest of the features. For people who don’t have much experience tuning one of these saws, the out of the box calibration is even better for you. We suggest giving the DWS780 a serious look to buy. The DEWALT DWS782 provides you with a 12 inch blade, which is one of the larger models for a miter saw. It comes with 15 amps of current and a 3800 RPM motor. Without a doubt, this thing won’t have issues shaping your wood. It is also a dual bevel, so you are going to be able to make cuts at greater angles than you could with a single bevel miter saw. There may be some of you that have issue with slipping. With this DEWALT, you don’t need to worry about that. You fill find 10 different adjustable stops which will allow you to lock it and get the job done. And with the dual bevel, you are going to be able to do it on both sides. You will be able to handle any angle you through at it. For those people who don’t need angles right away, most people who just want a straight 90 degree or 45 degree cut have said that it does good out of the box for those. The tail sliding fence allows for crown modings up to 7 /12” and for base modlings up to 6 3/4”. Other customers have used other blades with the DWS782 and had no issues at all with compatibility. It does get a little jerky when you first start it up, however. It pays to start off slow so it stays stable at higher speeds. Once your there, everything should be good to go. Dust Collection. Built in dust collection mechanisms make clean-up a breeze. Dual Bevel. Dewalt makes a great double bevel. You can be certain you can hit all the angles you need for any complex cuts. Portability. This thing is compact. The lightweight frame makes it easy to pack up and store wherever you want. Once you get the fence set to square with the blade, if stays there pretty well. The miter rotation is simple to change and is quite accurate for most all projects, including frames. The locks make it easy to stay in place. You get a lot of power with this to shape your wood however you want with no slowdown in sight. Getting things setup are quick and easy with the 10 positive stop options. It is simple to get up and running. While it is portable, it is also pretty heavy. If you don’t have a lot of strength you may be one of the ones who has issues moving it around. Supports base modling up to 6 3/4 ” and crown molding up to 7 1/2 ”. While pricey, the DEWALT DWS782 is worth the purchase. The adjustability of it makes it completely worth it. Every part of it is adjustable and it allows you to make some great cuts in some tough conditions. Even with all of the adjustments, most people are able to use it straight out of the box, so you may not even need to wait to get going with it. If you need to change it later, of course you can do that. We give the DWS782 a great recommendation. Miter saws are an essential tool for carpentry work but not all types will fit to your specific needs as a consumer. This review will cover up all the capabilities and disadvantages of the Dewalt DW716 Double Bevel Miter Saw giving you an idea whether this saw is for you. Continue reading and learn why most people find this a saw worth giving a try. Don’t worry about product reliability and build quality. This product is made under the brand name of DeWalt, a brand that has been making miter saws for quite some time and has made a name for themselves in the business. The brand specializes in hardware materials giving you assurance that this product is a long lasting piece of tool. 15-amp motor – this saw packs a lot of strength being powered by a 15-amp motor. You can basically cut through any type of wood with accuracy and smooth finishes. Safety – even if you’re a person in the business for a long time, accidents are still inevitable. Since you are dealing with heavy objects and a sharp cutting blade rotating at 3,600 rpm, safety is a main priority for miter saws. You basically have a blade guard that is in sync with the arm of the saw. Once you place the blade down, the guards move up and protects your hand, pull the blade back up and the blade guards drop back to place. Portability – blades, heavy metal components and a motor are all cramped up on a miter saw making it usually heavy. The Dewalt DW716 Double Bevel Miter Saw is specially designed as to maximize portability with an average weight of 44 pounds. It is not the lightest miter saw out there but it is still under a manageable weight for easy portability. 12 inch blade – Keep in mind that the larger the blade, the higher the maximum cutting height capacity. The 12 inch blade allows you to cut a maximum height of 6 and a half inches with safety fences of 5and one-fourth inches in height. Blade stops – since you are dealing with hard wood and a strong motor, it is going to be a problem to be in control while you maneuver your blade to get those tricky cuts. A small jiggle on the hand and you have yourself a jagged and inaccurate finish to your word work. The use of premade blade stops that lock the blade in common positions while you apply force prevents any unwanted movement giving you accurate and desired results. The saw mainly has 11 stops for miter cutting and 7 different bevel stop angles. Despite all the high quality parts this saw is made from, there is one part that was left behind. The throat plate of the saw is made from cheap plastic which wears so fast after a few uses. Something you would not expect from an expensive machine made from DeWalt. Though this is easily fixed by a simple part replacement and doesn’t cost that much. The Dewalt DW716 Double Bevel Miter Saw is a compact yet powerful miter saw surely to accomplish any carpentry needs and comes with a slashed down price . Along with the tool comes a long term relationship with the company through their 3 year limited warranty guarantying non-stop service from unforeseen factory damages. It also comes with a year worth of service contract and a 90 day money back guarantee to assure you that this tool meets up to its price. The tool itself performs extraordinarily, but get the best out of it by setting it up properly. The standard procedure is the same as any other miter saw setups. Nail, screw or lock the miter saw on a compatible stand. Mount the piece of wood to be worked, lock the miter table, and adjust the fences and lock the desired bevel angle and you will surely to get clean cuts without much strain or effort. This is designed to be a portable device but did not risk the blade size for maximum cutting sizes. The Dewalt DW716 Double Bevel Miter Saw is a recommended saw for on the field workers who carry around their own tools but maybe too much for people who only consider wood working as a hobby. The Dewalt DW716 Double Bevel Miter Saw lives in a family of saw cutters and this one received a lot of hype in the industry lately and has been the top selling miter saw at one time. People recommend this saw because of accurate and smooth cuts which everybody is looking for, along with multiple safety standards and long lasting high quality components. This review revolves around all the specialties and capabilities of the DW713 miter saw. Everything you need to know about it can be found here. Have a good read and find out for yourselves if this miter saw fits your needs and also learn why most people prefer it. The DW713 is made by DeWalt, a famous company already specializing in the production of different hardware equipment. They are one of the leading brand names in the construction supplies industry which gives you a thought of its reliability. There are much to take note about this product. It features new innovations and add-on capabilities which may play a huge part in your role as the consumer. Depending on what you are looking for, this might be the best out there for you. 15-amp motor –with a strong motor, you are sure to get smooth cuts. May it be soft wood or hard oak wood, you are surely going to get good cuts on your wood. Detent plate –You are dealing with saws and wood which makes smooth and accurate turning a big plus for the saw. The detent plate of the DW713 features 11 stop points designed to hold lock your position when cutting in angles. The stop points keeps you in place while you’re making your tricky cuts resulting in smooth finishes. Safety fences –Just before you put those blades down on your cutting board, the safety fences simultaneously rises up giving protection as you cut along. This gives you a view of your other hand while you’re putting down your saw giving you time to realize whether your hand is on the way of the saw just before the fences pop up blinding your view. Lock – with all that power on your motor, the wood you would be cutting is likely going to wiggle and result to jagged edges. Don’t fear because the DW713 has a strong miter lock for accurate miter table positioning. Lightweight –Just weighing an average of 35 pounds with compact features, you can simply hand carry this saw without risking backache or extensive strain just before doing the real work. Short safety fence – the shorter the safety fences the shorter the maximum vertical cut limit. Something not fit for heavy workers looking for an all-around machine. The saw basically just has a maximum vertical cutting limit of 6 inches. This is because of the goal to become a compact cutter. Preventing you from cutting tall stalks of wood. At a slashed down price you get a highly compact and lightweight cutter that still packs a lot of power. Running 5, 000 rpm at a no load speed, this is as fast as it gets compared to other models like the DW715, DWS780 and DW716. The price comes with a long term relationship with the company with a 3 year limited warranty assuring you of 3 years non-stop service. Along with the standard warranty comes a year of free service contract and 90 day money back guarantee. All the more reasons to be self-assured of what you are going to buy. The DW713 works best under certain conditions. Get the best out of your machine by setting it up properly. Just like any other miter saw, screw or nail it on a usually miter stand. Screwing is more preferred since this is made as a portable and moveable saw. Place the wood to be cut on the miter table and adjust the safety fences. Locking the miter table and safety fences will guarantee the best results. The locks keeps the blade in its path no matter how much force is being applied guarantying quality cut. The main goal of its design is to achieve portability which is more targeted on the enthusiast rather than the heavy workers. This is also just meant for on the field workers who need portable machines to cut small wood. The DW713 is not designed for an overall use device as its cutting limits are limited. The DW713 has received a lot of hype because of its features and functionality. This is a great product and a lot of people have found it a great substitute and replacement in most cases. This is a great cutter for starters and people are going for it. Buying the DW713 will save you a lot of future expenses. The well-built frame, neck and body will last over a lifetime being made from stainless and quality hard steel. Parts are also easily accessible due to easy compatibility with its other predecessors. The design prevents any unwanted spraying of saw dust, allows a free moving and adjustable blade and many more to give you the best quality cuts. The DW713 is guaranteed to help maximize get those smooth cuts with ease. No more back pains, arm aches and over the top muscle strains with the DW713. The Dewalt DW715 is a 12-inch compound miter saw featuring 15 amp power at 4000 RPM no-load speed, which offers more extended power and durability. It incorporates an adjustable stainless steel miter detent plate with 11 positive stops for the most popular miter cuts. There’s also a high quality manual override for custom miter cuts. You don’t have to worry about slipping to any of the built-in positive stops. This feature makes it possible to replicate miter angleswith precision time and time again. The machine based fence design is a unique innovation that delivers long term fence straightness by providing the necessary support. It has a tail sliding fence for crown molding up to 5 -¼ inch nested and base molding up to 6-1/2 inch vertically against the fence while easily sliding out of the way for bevel cuts. The tall sliding fence design makes it ideal for working with crown and base moldings. It has a convenient cam-lock miter handle which makes adjusting to any desired angle fast and accurate. This miter saw allows for manual override without the saw accidentally slipping to any of the pre-set positive stops. Pricing. Dewalt makes a double bevel miter saw, but it over 100 USD more. Durability. There are countless customer reviews supporting this. Once you get the fence set to square with the blade, if stays there pretty well. The miter rotation is easy to move and is quite accurate for most all projects, including frames. The saw has plenty of power to make cuts into various types of woods with no troubles or slow downs. You can use it mostly for rough cuts (close enough), which is the typical application of miter saws. The blade brake is extremely effective, you don’t have to worry about the blade continuing to spin once the saw has been stopped. Setting up miters and bevels are super easy with the provided gauges. This is only a single bevel saw. Dewalt also makes a double bevel saw but it is over 100 USD more. In addition the double bevel model has less power, running at only 3600 RPM This miter saw operates at a relatively loud level. The DEWALT DW715 15-Amp12-Inch Compound Miter Saw is an impressive saw, head and shoulders above the competition. It’s received nearly 5 out of 5 stars from several customer rating and review sites. The key features are its durability and precision. The adjustable stainless steel miter detent plate with 11 positive stops at the most common settings is a strong selling point as well as the manual override to work with custom angles. Portability is an added bonus due to its perfectly placed, rock solid handle. Click on the link below to purchase this product. Basic miter saws can be used to make miter cuts for things such as picture frames, simple molding, carpentry finish work, and other projects requiring an angled horizontal cut. They also make great, square crosscuts. These saws do not cut bevels or adjust for wide lumber, so they are most appropriate for most basic applications. These saws are often lightweight and reasonably priced, they are a good entry level carpenters choice in tool, this is especially true if you are replacing a handsaw or miter box. Compound miter saws make straight cuts as well as miter and beveled cuts. These saws blades can be tilted to make beveled cuts and come in single or dual modes. Single compound mode units tilt only one direction usually within a 45-degrees. To make cuts in the opposite direction, the saw user must re-position or move the work piece. Models with dual compound tilt in either direction so the work piece does not need to be flipped around. They are a great choice for frequent bevel work such as crown molding which takes a bevel angle at both ends. A compound bevel saves the time of moving and re-positioning the piece in order to make the second cut. These saws are also very handy for working with large pieces that are cumbersome to move. Again, while single compound saws are often lighter and definitely less expensive than dual compound saws, a compound miter saw adds the convenience that can speed up projects and improve accuracy. If doing more than the occasional bevel work, it might be wise to consider a dual model tool. Sliding compound miter saws have the same features of a compound saw but with the addition of a sliding arm for cutting wider lumber. The arm moves the motor and the blade assembly across a larger cutting area than the other models saws can accommodate. When making crosscuts in wide lumber, the user can push or pull the blade through so that it cuts in one pass. Sliding compound miter saws come in single and dual bevels and are by far the most versatile type of miter saw as well as pricey. But you may want to consider one if applications involve different widths of material. People have special needs and for us carpenters, one of the greatest hindrance that we experience in everyday work is cutting wood. Sounds easy to do but it is actually hard to accomplish if you have certain specifications to meet like cutting a wood in angles, making the perfect crowns and don’t forget about cutting curves. All of these are nearly impossible to accomplish if you only have a manual manpowered saw. So, how do you make this task achievable as well as easy? Simple, you get a miter saw. It is powerful, accurate and long lasting. You are not limited with the possibilities you can do especially that there are a lot of miter saws in the market. There is no uniform design to follow which gave companies the freedom to design whatever they like but this made it hard for us users. Choosing the best miter saw is tricky though certain guidelines to follow will make your purchase worth every penny. Don’t judge a book by its cover as they say but if a company has made a good reputation with its products then the chances of being dismayed is smaller. There are certain brands to take note since they have made a name for themselves which gives these products the priority when left choosing with two equally designed products but of different brands. If you are in a store that has a portion for Makita products only, you might want to go with that aisle directly. The brand has been in the motor tools business for nearly a century. This vast amount of experience has taught them a thing or two about what the customers want and what their devices need. Their process of building starts with choosing only the best grade steel as well as using only 97% pure magnetic copper for their motors. They also test their tools under extreme conditions that cannot be simulated under normal work conditions which made these products tough and highly tolerant. If that’s not enough, you wouldn’t even have to worry about defective products since inspections are tight. They perform a 19 point inspection for the motor alone as well as running it in maximum for 3 minutes. Quality and perfection is what is being described with DeWalt. Overall, it only just comes below the ranking of Makita and that is because they impose nearly the same level of strict building. Though if you are on a budget and in the pursuit for a cheap miter saw, might as well stay away from this brand. Despite its high-quality tools, priced between mid-levels to expensive, the cheaper ones are actually no good. Not all are bad, they just have their own ups and downs with the downs dominating. Currently, Hitachi is being described as a fading brand in the tools business but that is not an accurate description. Compared to other brands like the Ryobi, the Hitachi is still a preferred choice. They don’t put that much planning and innovation to their design so don’t expect some well-packaged saws as well as some logical and ergonomic features. In terms of quality, they still stand a chance to compete with Makita. No miter is a saw without a blade which is actually quite obvious but what is actually not obvious is the size of the blade. A lot of people new to carpentry work are always bothered on what diameter of blade they should use and in all honesty, it is actually a very tough choice since bigger is not always better. Choices in the market range from 12, 10 to 8 inches. Larger ones have higher cutting capacity but are harder to control and work with if you have very small wood to cut. Smaller ones on the other hand are impossible to use with thicker wood. Miter saws have a lot of moving parts which enables them to be flexible in any situation. Among the parts that needs to be moveable are the table and the neck. The neck should not only be limited to going down but also to go sideways, a feature essential for cutting crowns. The table should also turn for easy angle cuts for baseboard and other flat boards. The key to a perfectly cut wood is a perfectly strong motor. Don’t just look at the motor and be deceived with size but instead be more technical. Nothing much to remember, the motor should at least be 15 amps and be able to achieve 5, 000 rpm without a load. If it satisfies this criteria, you have a sufficiently good motor that can cut through any type of wood. As what I’ve said, there are many variations, and companies tend to put a lot of features to make it more functional. 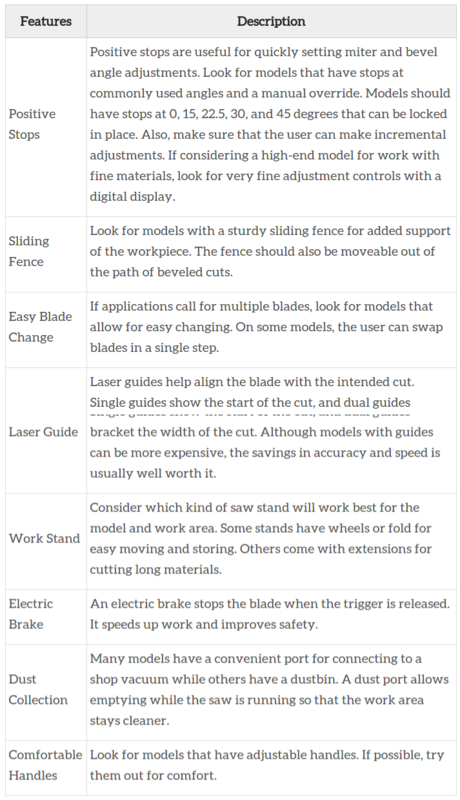 You might find the following features in some selected saws. Guide laser – for a preview where your blade is going to cut. Overhead light – convenience to cut in the dark. Synchronized blade cover – for active blade protection. Dust tube – for a mess-free working environment. It is normal to experience dilemma when buying your miter saw. Even the experienced laborers still have problem choosing theirs. Just remember that the blade size must fit the type of wood you are cutting and that the motor should suffice the standards mentioned. For additional work flexibility, choose a saw that has a moveable neck and a turning table. If you suffice the three but caught up between two saws, let the brand names be the tie breaker.